Y’ a pas de prévenance ! gathers for the first time Jean-Charles Hue’s texts. The artist created this book as a journey in his artistic world, between the gypsies and Mexico, with Tijuana and its dog fights. To this aim, he put into dialogue his texts with images from his films, videos and photographic series. One of them has been realised especially for the occasion. We discover the characters and histories from his films and videos, full of humour and epic at the same time. Oral language and slang, which are characteristics for his texts and use tones similar to ancient French, take us to a timeless world. The objects (military flask, gun, knife, car) which keep appearing in his artistic vocabulary are guides in this book which mixes crudeness and sensuality. Surprising. If I had to choose a single word to describe this work, this would be it. Surprising. As I turned the pages, I went from surprise to surprise until the very end. 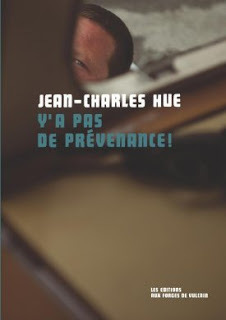 What is sure is that Jean-Charles Hue’s book is not ordinary. So I will start by thanking the A&M forum for organising this unusual partnership and the publisher Aux forges de Vulcain for providing me with a copy in exchange of an honest review. It was a remarkable discovery and I am glad I seized the opportunity to read something different. I would like to focus on the appearance of the book first, as I was extremely impressed by the quality. The cover is rather dark, so is the title, and there is no summary on the back cover. These are normally pet peeves of mine. However, as I opened the book, the layout took my breath away. There are pictures, different kinds of texts… all of them very elegant, and it is a bilingual edition (French – English). I suppose that given Jean-Charles Hue’s artistic path, it could be expected, but to be honest, I did not really know what to expect of this book. About the reading, I must admit I was a little bit confused to start with. Confused about the images, which I did not really understand. Confused about the darkness that showed through the texts and pictures. Confused about the vocabulary, which is familiar and oral. Confused about the bilingual version: should I read English or French first? I was a little perturbed by the unusual aspect of this book. I decided to start reading the French texts, as it is the original language, and then the translation. In reality, I mixed it all. As I went through the short stories, I got used to the style and understood the pictures better. There are nine different texts, whose length varies between a few lines and twelve pages. They take us on a trip in the author’s universe, recreating important moments of his life. So we discover a few anecdotes from his childhood, his life with gypsies, his travelling in Mexico, various characters… All of them seem rather unconventional and a little bit strange to start with but we get to know them better and at the end, we understand their significance for Jean-Charles Hue. The vocabulary used was certainly my greatest problem: slang, oral expressions, words used in the specific environments I mentioned before. Fortunately, the advantage of the bilingual version was that I could swap from the French version to the English one whenever there was something I was not sure of, which made it easier to have a global comprehension. Another great strength of the book is the interview we can find at the end. It features questions by the publisher and answers by the author. They give extra information about Jean-Charles Hue’s life, his vision of art, as well as explanations about some of the photographs and their affective importance for him. In these pages, no more slang, the style is elegant, which makes a clear contrast with the stories. I liked that, because we can see the difference between the real world and the artistic world. Slang is the charm of the gypsies’ environment, of Mexico… It makes us feel there. At the end, there is also a short biography and pictures captions, which is useful to understand the images better. The fact that a few of them come from the films Jean-Charles Hue realised made me want to watch them and, like I liked the book, I liked the extracts I have seen so far. The only criticism I can think of is the darkness of the scenes, which often made it difficult to make out the subjects. I would have liked to be able to see more, to gather details but I think I can understand why dark colours were chosen; they match the texts better and give the pictures a mysterious aspect. Regarding the target audience for this book, I do not really know who I would recommend it to. One of the most important things, in my opinion, is that the reader has to be open because it is an unusual work. I do not think you have to particularly like contemporary art to enjoy this book, although most of the pictures are in this style. I must admit I am not normally keen on it, but I enjoyed the book. If you want to take a trip in an uncommon world, meet gypsies, Mexicans, and are not worried about slang and oral style, you will surely appreciate Y’a pas de prévenance. Good review. I like surprising books sometimes. Have you tried Elizabeth Kostova's THE HISTORIAN?